The Democratic Party of Orange County (DPOC) took up an issue regarding the actions of their Vice Chairman Greg Diamond which caused Orange County Labor Federation calls for his ouster. Last night, DPOC removed Diamond by a vote of 35-15, which requires 2/3rds for removal of an officer of their organization. 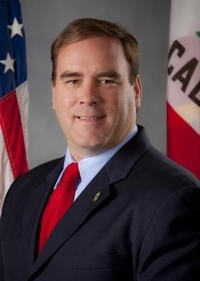 Ironically in January, the same Democrats, notably Senate President Darrell Steinberg, in the State Senate will not remove or call for resignation of Senator Roderick Wright despite the guilty verdict has been rendered upon him. Dues shall be sixty dollars ($60.00) per year for each member including alternates and are due payable within 60 days of assuming membership. However, hypocrisy is nothing is new for the Democrats, but it sure is revealing of how they handled their own county party officer versus that of an elected official that was convicted by the jury of his peers who is now on a paid vacation. Furthermore, the requirement of paying dues to cast ballot should give pause, because the right to vote should not be coerced via payment of dues for any political organization, but I will let that issue rest on the conscience of the Democratic Party of Orange County. We’re live from the Feet to the Fire Forum for the Second Supervisorial District. Yours truly got promoted to the media table. The candidates are seated in this order from left to right: Board of Equalization Member Michelle Steel, Coast Community College District Trustee Jim Moreno, Assemblyman Allan Mansoor, and Huntington Beach Councilman Joe Carchio. Moreno is a Democrat while the rest are Republicans. The media panelists are Norberto Santana of the Voice of OC, Alicia Lopez of the Daily Pilot, Jack Wu of the OC Register, John Canalis of the Daily Pilot, and Barbara Venezia of the Daily Pilot/OC Register. (7:02 PM): Canalis asks if the candidates would forego a Supervisorial pension. Steel would forego the pension. Moreno would donate the pension to an account to fund nonprofit organizations. He would do the same with his commission stipends. Carchio says he did not accept a pension in Huntington Beach and would not accept one at the County. 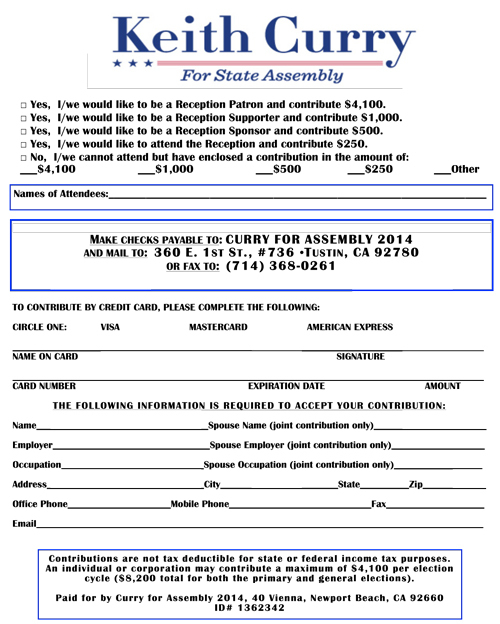 Canalis asks if the candidates would vote to outright ban Supervisorial pensions. Moreno says he would not. Wu asks Moreno about pension reform. Moreno says pension management would need to be examined. Venezia says all the candidates’ Web sites abstractly speak of pension reform without details. Mansoor says he would lead by example. Steel says unfunded liabilities are a problem and notes the County was 100% funded in 2000. She says economic growth and demographic shifts combined with rates of return must be accounted for. She speaks about the recent amortization changes at OCERS. Mansoor says he left the Sheriff’s Department to go to the Assembly where he has no pension. Carchio speaks of the need for employees to pay for their entire employee pension contribution. Lopez asks Steel about her endorsement from Sheriff Hutchens. She asks about offering a raise to deputies in exchange for them paying their entire employee contribution. Steel points to the example of OCEA. She says she wants to look at the numbers to be sure of what solution she would pursue. Mansoor opposes the pay raise because it would increase the pension obligation. Santana asks Mansoor about the risk of deputies being poached by neighboring agencies. Mansoor says these are difficult times and difficult decisions need to be made to make the County solvent. Wu asks Mansoor about leading by example by refusing the pension. Mansoor says it would be irresponsible to ask employees to entirely give up their pensions. Santana asks how would spending more to pay down the pension liability affect spending on other County programs and services. Steel points to waste, fraud, and abuse. She gives an example of verifying welfare eligibility, modeling after a San Diego County program that saved $500,000. Steel says the OCERS investment returns should improve to reduce unfunded pension liability. Moreno speaks about asking college employees to tell his college board about waste, and they found $10 million in waste. Lopez asks Steel about how to fix CalOptima. Steel says there needs to be more transparency and points to the appointment of two Supervisors at CalOptima. Moreno says experts need to be brought in to fix the problems. He says the Board must have experts managing CalOptima. Carchio says in Huntington Beach that they got employees to retire early, implement a 4/10 schedule, and other creativd ideas related to balance the budget after the loss of Redevelopment Agencies. (Editor’s Note: What does this have to do with CalOptima?) He says that all we heard about was RDA abuses, but RDAs did good things. He says creativity with RDAs shows how to solve these problems. Venezia speaks about the 2012 election for Assembly. She asks about the criticism that Mansoor is leaving his Assembly seat early since he’s not termed out. Mansoor said he supported Don Hansen and jumped in when Hansen dropped out. He criticizes Steel for moving to Orange County to run for Supervisor as a platform to run for Congress. Venezia asks him to answer the original question. Mansoor again points to Hansen dropping out. 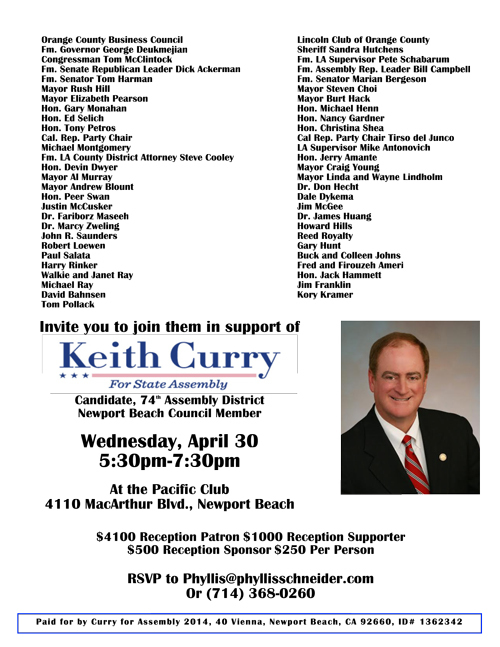 Venezia and Wu ask if he will jump ship if elected Supervisor. Mansoor starts to say that he wants a resident of Orange County to be Supervisor. Wu interrupts to ask how long does someone need to be an Orange County resident. He points to Mansoor’s endorsement of Jim Righeimer for Costa Mesa City Council after Righeimer moved from Fountain Valley. There’s crosstalk between Mansoor and Wu. Steel jumps in to point out she’s lived in Orange County since 2011. She speaks about immigrating from Korea. She asks if she needs to be born here. Carchio speaks about living in OC for 35 years and serving on numerous OC boards. Steel asks if it’s so important to have a long-term Mansoor why he doesn’t support Carchio who’s lived in OC for decades. Mansoor says he supported Hansen. Lopez asks Mansoor what legislation he’s passed in Sacramento. He points to various pending pieces of legislation. Lopez asks if he’s accomplished something as a legislator. Mansoor points to the challenges of being in the minority when there’s a supermajority. Wu asks Steel about her accomplishments as a member of the Board of Equalization minority party. Steel lists several other items that this blogger can’t keep up with. She says she is a consensus builder who can get things done. Moreno interjects that he has worked in the private sector, worked for an LA County Supervisor, served on the College Board, and been a father. Venezia asks about Diane Harkey’s husband’s investment litigation since Steel has endorsed Harkey for Steel’s own Board of Equalization seat. Steel says the courts already ruled that Diane Harkey was not part of this issue. She points to Harkey’s accomplishments in the Assembly. Mansoor points to his track record in the Assembly. He says he was willing to stand up to the Mike Carona machine. Santana asks who is part of the Carona machine now since Carona is in prison. Mansoor says Steel is backed by a lot of people who backed Carona. Santana repeatedly asks Mansoor to name names while Mansoor declines to do so each time. Santana then asks what each candidate views is the role of a County Supervisor. Moreno says the County is an arm of the state. He says the County takes care of social welfare, public health, and public safety issues. He says experts need to be running the agencies. Moreno speaks about solving constituent problems (i.e. casework). Mansoor points to OCTA and the 405 toll lanes. Wu and Santana ask Mansoor about other agencies. Mansoor says they need to let him finish his answer. He speaks about public pressure forcing OCTA’s hand on the 405. Mansoor says he would have a hands on approach. Santana asks what that means. Mansoor says he would audit the OCFA and points to his service on the Assembly Audit Committee. Carchio says the OCFA board is too large and needs to be reduced in size from 25, pointing to his experience on the 35-member Vector Control Board. Santana asks what size the OCFA Board should be. Carchio says he doesn’t have enough information to determine an exact number. Carchio argues he sits on more boards than Supervisors or Assembly members do. Venezia asks how much each candidate has raised for their campaign to get their message out. Wu says the candidates should exclude loans from their numbers. Steel says raising money is hard work. Mansoor speaks about issues mattering more and says he has a history of beating better funded candidates. He points to his endorsements from outgoing Supervisor John Moorlach and several district mayors. Lopez asks Mansoor about his reputation on immigration and the Latino vote. Mansoor says he is not anti-immigrant. He says he supports legal immigration and is the son of two immigrants. He says his actions in Costa Mesa only related to illegal immigrants who committed other crimes. He says Steel has said different things to different people, telling some that she opposes the Lincoln Club plan and telling others that she supports aspects of it. He says he supports eVerify, but Steel opposes it. Steel says she is an immigrant. She supports a guest worker program. She supports the Lincoln Club plan. She opposes eVerify. Wu asks Mansoor about the legislative letter he signed that got sent to members of Congress. Mansoor says the published portion was out of context from the letter he signed. Moreno speaks about the DREAM Act. He says these students are indistinguishable from kids born in the United States. He calls for prevailing wage in any guest worker program. He says LAX is where illegal immigrants come from. He points to the deportation of Australians. Carchio says he went to a Sacramento press conference with Assemblyman Jimmy Gomez and his bill on human trafficking. Carchio speaks about high levels of human trafficking from China and Vietnam. He wants an equitable settlement where everyone is treated like a human being. Venezia asks why she should vote for each of the candidates. Steel speaks of her BOE track record and her efforts on behalf of taxpayers. Moreno points to his experience working for an LA County Supervisor and his service on the Coast Community College Board. Mansoor says he will stand up to special interests and political machines. He says he has an open door policy and will always listen to constituents. Carchio points to his lengthy time as an OC resident. He speaks about his business owner experience, his experience on the City Council, and his experience on regional and state boards. Despite starting slightly late, the forum ends right on time at 8 PM. Assemblyman Curt Hagman (R-Chino Hills) offers his thoughts regarding the corruption scandals of Senators Calderon, Wright and Yee that made headlines the past few months. Hagman represents the 55th Assembly District and currently candidate for San Bernardino County Supervisor. Recently, news of yet ANOTHER state senator being indicted for corruption sent shockwaves throughout California. When I heard the charges against San Francisco’s Leland Yee, I shook my head in disbelief. Could a man known for his gun control efforts be part of an international gun trafficking ring? We do not know all the facts, but I do know that the charges against him are so serious that the Legislature cannot pretend that it should conduct business as usual. The troubles of three state senators now mean that more than 10 percent of the Democrat members of the State Senate are either under indictment or have been convicted of a felony. Senator Yee joins two other senators who are also facing serious legal trouble. One senator is facing bribery charges while another was recently convicted of a felony for lying about his residency – as he resides outside the district he represents. And how did the Senate respond? They voted for Senate Resolution 38, which gave all three senators paid vacations. The Resolution also plans to give all senators and their staff additional ethics training. Presumably they will be told that trafficking rocket launchers, taking bribes and making deals with mobsters is inappropriate at any time. To be fair, the State Constitution currently gives no authority to the Senate to suspend legislators without pay and President Pro Tem Steinberg is proposing a constitutional amendment to finally fix that issue. I’m astounded this has not happened sooner. Ultimately, all three senators should resign from office to remove the thick fog of corruption hanging over the State Capitol. As long as they are allowed to remain in office, it will be much more difficult to make progress on the issues that matter to all Californians such as jobs and public safety. The public is already deeply cynical about government and the least elected representatives can do is take responsibility for their actions. Unfortunately, it is hard to ignore the fact that the alleged corruption took place in a political environment where one party has absolute control over Sacramento. As that popular saying goes, “Power corrupts; absolute power corrupts absolutely.” When one party is accountable to no one, it makes it much more tempting for some to overreach and abuse the power entrusted to them by the citizens. I have spent years as a volunteer for the San Bernardino Sheriff’s department and have seen firsthand that sitting behind bars is the last thing anyone wants to do. Perhaps all elected officials should take a prison field trip as part of our annual training? It would be a more powerful lesson than ethics training and suspension with pay. I know that Californians are sick and tired of the mess in Sacramento and want to see an end to the culture of corruption. Elected officials need to be held accountable to the people of their district and the citizens of California. You, the voter, can help by electing men and women with integrity and character – who will do what’s right even when the FBI isn’t eavesdropping. The assault on the Public Records Act (“PRA”) has garnered a lot of attention recently. Last year, the legislature attempted to make compliance with the PRA voluntary, rather than mandatory as it currently is. The swift outcry led to a hasty, and wise, retreat and the bill died as it should have. However, the Court of Appeal has again stepped in the PRA fray, and I believe it missed an opportunity to close a dangerous loophole created by technology outpacing the law. In City of San Jose v. Superior Court, decided last month, the 6th Circuit Court of Appeal was faced with the question of whether emails and text messages sent to or from public officials’ and public employees’ private electronic devices, using their private accounts, were required to be disclosed pursuant to a proper PRA request. The trial court had held that communications on private devices were “public records” under the PRA and were required to be produced. Unfortunately, the Court of Appeal disagreed and reversed the trial court. With the Court of Appeal now holding that communications using private devices are not subject to disclosure under the PRA, the potential for abuse is obvious. In fact, the City of San Jose Court specifically stated “[t]hat city council members may conceal their communications on public issues by sending and receiving them on their private devices from private accounts is a serious concern. . .” However, the Court left it to the legislature to deter such behavior with appropriate legislation. I will note the irony given that the Democrats in the legislature recently wanted to gut the PRA by making it voluntary. This trend towards making government less transparent is troubling. We already have seen that Obama’s EPA officials have used their private email accounts to aid environmentalists, with the head of the EPA creating fake email names to hide her actions. It is likely that a large number of public officials and employees are using their private accounts for public business, whether it is to hide those communications from public view or not. Given how slowly the state legislature reacts to decisions like these (and its own efforts to undermine the PRA), I believe that the best way to curb these abuses is for local cities, counties, and other agencies to implement their own policies prohibiting officials and employees from using their private devices or accounts to conduct public business. These policies will only be effective if violations are dealt with severely. This also could increase costs for local agencies should they choose to purchase electronic devices for each public official and employee, but the resulting transparency should be worth the cost.